New illustration added to the "Horror" gallery, titled "Kendra dies... again", for the Lamentations of the Flame Princess role-playing game. New oil painting added to the "Personal Work" gallery, titled "Cryptic wave". New design added to the "T-shirts" gallery. 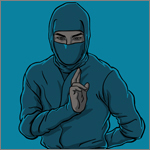 "Ninja Gifter" was chosen as the winner for the "Front & Back" challenge and is now available at Threadless. Launching the new improved Illusory Dreams! It has a new look, simple and uncluttered, now with top banners and bigger thumbnails. It is also easier to navigate. I got rid of a lot of useless stuff, added a few new things, and now I am really looking forward to add more content and to continue to share my work on the new site! (1987-1990)". Both are released on Stormspell Records. New design added to the "T-shirts" gallery. "Super Playbros" is available at Threadless as T-shirts, iPhone cases and wall art. New artwork added to the "Heavy Metal" gallery. 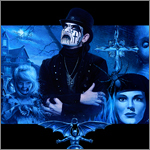 This is the cover for King Diamond's new "best-of" album: Dreams of Horror, released by Metal Blade Records. 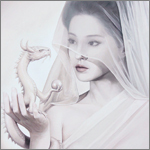 New oil painting added to the "Personal Work" gallery, titled "Ethereal and beyond". 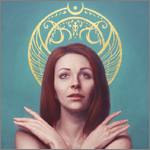 Two new oil paintings added to the "Personal Work" gallery, titled "Equilibrium philosophy" and "Ardent soul"
New illustration added to the "Other" gallery. 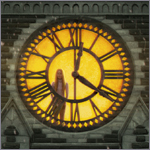 This is the book cover for "Winterlight" written by Jason Garrett. New oil painting added to the "Personal Work" gallery, titled "The secret mediator". New oil painting added to the "Personal Work" gallery, titled "Mystical wisdom". New design added to the "T-shirts" gallery. "Dragon priestess" was chosen as the winner for the "Surreal Fantasy Design" challenge and is now available at Threadless. 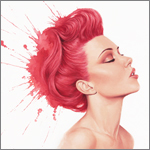 New illustration added to the "Horror" gallery. 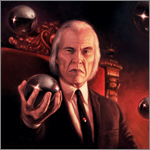 This is the cover of the Phantasm special editon boxset released by Well Go USA Entertainment. 2 new paitings added to the "Personnal Work" gallery, titled "Halo" and "The water chalice". 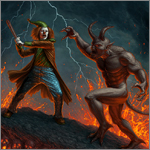 New illustration added to the "Horror" gallery, for the Lamentations of the Flame Princess weird fantasy role-playing.